Childages: 4 to 12 years old. Children under 4 are free. Enjoy a casual weekend brunch complemented by live music and fine champagne, along with the spectacular scenery that makes San Francisco famous on the San Francisco Brunch Cruise. 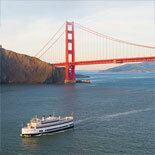 Dazzling waves and soft breezes set the mood for the San Francisco Brunch Cruise. A good-morning getaway featuring free-flowing bubbly. The enticing outing includes a buffet stocked with classic breakfast dishes, lunch entrees and desserts. With live music and views of the San Francisco Bay's renowned sights, it becomes the perfect way to unwind after a hectic week. San Francisco Bay's famed bridges, landmarks and city skylines shape some of California's most legendary coastal scenery. 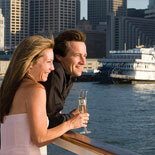 By offering a casual brunch cruise, Hornblower offers an unparalleled way to see these sites. From Coit Tower to Alcatraz, and from the Bay Bridge to the Golden Gate, this is the most exciting tour between sea and sky. 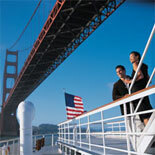 Whether the highlight of a California vacation or a close-to-home birthday, anniversary or a romantic cruise around San Francisco Bay, a San Francisco Brunch Cruise is always memorable. All aboard! Some beautiful San Francisco memories are waiting to be created. 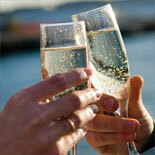 Make reservations for the San Francisco Brunch Cruise and get your eTickets now! Operates Saturdays & Sundays year round. Leaves from San Francisco Pier 3. Boarding time: 11:00 am. Sails: 11:30am - Returns: 1:30 pm. Pier 3 is at the foot of Washington St, between Market St and Broadway. Parking is available at Hornblower's Parking Lot. Limited public parking is available at Pier 3. $10.00 per car. Contact customer service for details and transportation options. Reservations are required 72 hours in advance of desired cruise. No jeans, shorts, tank tops, flip-flops, or gym shoes are allowed at any time on any cruise | Boarding time is 30 minutes prior to cruise departure. Please reconfirm boarding time prior to cruise| Gratuity is not included in your ticket price | Hornblower sails rain or shine. In the case of severe weather conditions, or upon the direction of the U.S. Coast Guard, Hornblower will remain dockside | All sales are final and non-refundable. A 48 hour notice is required if rescheduling is necessary. Refunds will be in the form of a Gift Certificate | Smoking is allowed on the outside decks only | Please check with Customer Service for handicap accessibility.